TBH the annoucement I'm waiting is the re-issue of the Black Knight and Adventure OST's for the west, will we ever get those? I never had a problem with it, yeah they post more memes than anything, I myself end up enjoying most of them. Puns and "silly jokes" can work quite well if done right, and they mostly pull it off with their posts IMO. Did I just witnessed someone who loved The Last Jedi talk about legacy and respecting legacy? I'm sorry, but I need a moment to process that. This is still my favorite version/remix of Reach for the Stars, and I've listened to many. 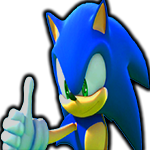 Oh, I know I'll enjoy this movie, be laughing with it or at it, now, if it turns out to be a genuine good movie that does capture Sonic's spirit well, the design will not prevent me from enjoying it for what it is. I guess i'll quote the OVA, but remove the question at the end. The first image i saw (the one from the style guide) I thought "Ehh, It can work, it's not that bad, it reminds me of '06, it can work" , then I saw this render and I'm like "Excuse me how even?!?" Well, after a break I finally caught up to the latest comic, the last time I wrote here i wasn't impressed with the comic, it was lacking in many departments IMO and it wasn't really giving me that feeling of need to read the next issue (I was at issue #09 for the record), and now at issue #14, things have really changed for the better, much to my surprise. The two final issues of the battle for Angel island were really action-packed, Master Overlord was a nice mid battle twist and it ended on a positive note. While the heroes were fighting, Eggman (Mr. Tinker) was being kidnapped by Rough and Tumble, both working for this still mysterious Dr. Starline, who was planning to revert Eggman's memory loss, for unknown reasons at the moment. On the next issues Eggman recovers his memory after seeing Metal Sonic, and Starline pledges alliance as an apprentice/would be sidekick, even giving the doctor all seven chaos emeralds, a self-proclaimed admirer of Eggman's work, he seems as loyal to the doctor as any of his machines, Starline also have the warp topaz, which grants him abilities to create portals, similar to Finitevus warp rings. Speaking of Finitevus, this character felt to me like a mix between Finitevus and Snively (maybe, depending on how his relationship with Eggman evolves) , and I really liked his presentation, his character, his teasing with Sonic and Silver, everything. Again, the new characters are still the high point of this new series for me, but now, closing the 14th issue, I'm more invested than I was when we were at the 9th, if we keep improving like this, I may start reading them on release day again, and I wish this day will come. About complaints, they are mostly the same, Too little worldbuilding IMO and lack of backstories, though I'm sure we'll get at least the latter down the road for sure, anyways, I'm happy with these improvements, and for the first time i can say I'm really looking forward to the next issue. Long time no see SSMB! I'm coming back, slowly but surely. Welcome back! Hope you’ve been doing well! About the Lost Hex, since it's described by Tails as a "land of illusions" or something along those lines (in the JP dub), can it be that some of it's locations and enemies are actually illusions? I know it'll probably never come back again, but now with the introduction of the phantom ruby this could lead to some interesting things, in both backstory/lore and for future games. May 2019 be an amazing year for us all!! that's also another reason I wish i knew how to draw. As for drawing you could always learn!